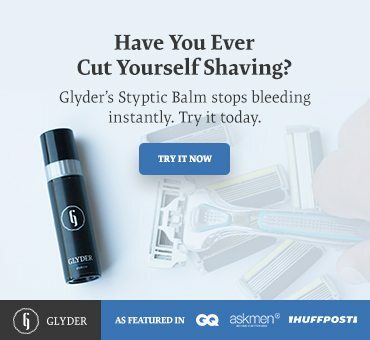 At Glyder we specialize in helping guys to keep their cuts clean, and stop the bleeding. However, there is more to a great shave, and a great face than just making sure you stop bleeding. Most guys are pretty familiar with the concept of moisturizer. They may even have their favorite brand of facial cream. However, when it comes to keeping their skin clear, and making sure that they don’t have any oily breakouts–guys aren’t always as good about knowing what to do. We want to be a resource that helps men to make the most of their face, because after all for many of us it’s our best asset. Chances are, a lot of men don’t know much about exfoliating. And even if they do, it’s not something that gets talked about nearly enough. So we wanted to write up a quick how-to post that can help you with the basics. Exfoliating is one of the best ways to clean your face of dead skin and open up your pores. It is a process where one of the biggest benefits for the bristly among us is that exfoliating makes shaving a breeze. Hot water and steam is a great start to soften the hair, but a good pre-shave exfoliation will make sure that you’re getting the closest shave possible. It depends. If you don’t exfoliate enough, you won’t see results. Exfoliating too often leads to redness, irritation, and dryness. These can be irritating to the skin, and actually make you look worse. On average, guys should be washing their face with a gentle cleanser twice a day and exfoliating once or twice a week. If you have sensitive skin, traditional exfoliators with pumice or crushed seeds might be too rough. Try a chemical exfoliator that gets rid of dead skin and debris without the need to scrub. Keep in mind that you should never double up — if you’re going to exfoliate, skip the cleanser. Alternatively, if you shave everyday and want the exfoliating benefits to improve your shave, consider making your own little exfoliating cocktail made up of part scrub and part cleanser. Shoot for a 50/50 mix. Should I Exfoliate Before or After Shaving? When you exfoliate before shaving, you not only scrub away dead skin cells, you unclog your pores and expose your hair follicles. When your hair follicles are exposed, your razor can get that much closer to your skin, giving you a ridiculously smooth shave. Unclogging your pores also prevents ingrown hairs which, if you’ve ever experienced, are an absolute nightmare that should be avoided at all costs. Ok, my man. Now let’s talk about how to exfoliate that mug. There are a few different options when it comes to finding the right tools for exfoliating properly. Just like shaving, guys have options of what kind of tools they prefer to use. Perhaps the easiest way to exfoliate is to purchase an exfoliating scrub. This is a gel-like cream that you can rub into your face with nothing more than your hands. For the more adventurous, you can buy an exfoliating brush with small bristles that can help to break down dead skin cells. This is a great way to make sure that you get everything, and can be cycled in between an exfoliating scrub routine. When you purchase a brush, make sure that you buy a brush to use on your face that is small, and isn’t too coarse. If you get something that is too rough it can cause pain. You can always buy a larger brush with a handle, or what’s called a loofah to exfoliate your body. However, it’s best not to use a loofah on your face, as it can be very rough. Okay, so you’ve got your supplies ready. You have some sort of liquid exfoliator cream handy, and for the tough spots you have your sponge or loofah. First, splash your face with some warm water to open up the pores. If you’re just coming out of the shower, just skip drying your face. Put a quarter-size drop of exfoliator in your hands and start to work it into your skin in circular motions. It should be very similar to how you normally cleanse your face — resist the temptation to scrub harder. It might seem like more force will help remove more of the bad stuff, but it won’t. All you’ll do is tear up your skin. Lightly scrub for 15-30 seconds, making sure to cover your entire face, up to your hairline and down to your neck. Spend a little extra time (and add a little more pressure) when scrubbing your beard. You want to expose those hair follicles as much as possible. Rinse off with warm water, and begin your shave as you normally would. You’ll notice right away how much easier your razor glides across your face with those hair follicles opened up. And that right there is a man’s guide to exfoliating. If you are looking to get into a regular exfoliating routine, then we suggest that you start by exfoliating only once or twice a week to see how your skin reacts. Then, after you’ve built it up for a few weeks you can move to three times or more per week. Exfoliating is best left to every other day, and probably isn’t something most guys need to do every single day. Hopefully, these tips have successfully demystified the esotericism of exfoliating for you. Got a question we can answer for you about shaving, exfoliation, or our Glyder styptic balm? Drop us a comment in the comments section below and let us know that you’ve got a pulse! We prefer human beings reading our blogs, we’ve got nothing against robots–but they don’t need to shave.